Sure, cats are great friends and pets, but they can be problematic too. Cats get bored and they need to use their claws, usually at the expense of your furniture. To keep your cat’s claws away from your furniture, let’s take a look at some of the best cat trees around right now. If you need an extra-large cat tree to keep your feline friend happy, occupied, and to keep it from scratching up the house, the Go Pet Club Cat Tree is a good option to go with. It is quite large, it comes with a few cool features, and it can keep several cats happy at once. The Go Pet Club Cat Tree is a massive 62 inch high cat tree. To get the bad right out of the way, this unit is huge, and it will take up a lot of space in your home. With that being said, due to its large size, it can easily accommodate up to 2 or 3 cats. If you only have a single cat, this will definitely keep it happy and last for years to come. It is covered with sisal rope in many different spots, all of which make for great scratching posts, so your cat does not end up ruining your home with its claws. The sisal rope used here is quite durable, it’s good for your cats’ claws, and it keeps them away from your furniture too. The Go Pet Club Cat Tree also comes with several baskets which your cat can relax in, plus a little tube that your cat can crawl through and lay in too. This cat tree features three separate levels, all of which are easily accessible, with a nice little perch on top. All of the areas meant to be comfortable are covered with soft faux fur to give your kitty a luxurious surface to lie down on. It even comes with a hanging rope, which makes for a good toy to keep your cat occupied throughout the day. This is a slightly smaller, more basic, and less expensive than the one we just looked at. It’s great for a single cat, it provides some resting areas, and it will definitely keep your cat’s claws occupied. It’s perfect for a single cat, or even maybe for two depending on how well your feline friends get along with each other. The AmazonBasics Cat Activity Tree comes in at 42 inches high, which is a respectable size no doubt. It might not be as big or be able to accommodate as many cats as the first option we looked at, but it is still great for a single cat or two. For one, it comes with three resting areas from top to bottom, all of which feature simple carpeting that is soft and comfy. There is also an extra perch on top that features short walls and carpeting, a perfect kitty bed and perch so your feline friend can lie there, sleep, and keep an eye on your home from up above. The AmazonBasics Cat Activity Tree also features a total of seven scratching posts, all of which are covered in durable sisal rope. Sisal rope is great because it helps shorten and sharpen your cats’ claws, it keeps them busy, and it keeps them away from your furniture too. At the same time, once the cat gets through the rope, the paper tubes underneath are not all that durable. On a side note, if you have a very heavy cat, if it lies in the top bed, the AmazonBasics Cat Activity Tree might become a little top heavy and unstable. If there are several cats that need to be kept busy, the SONGMICS Multi-Level Cat Tree is a great option to keep in mind. 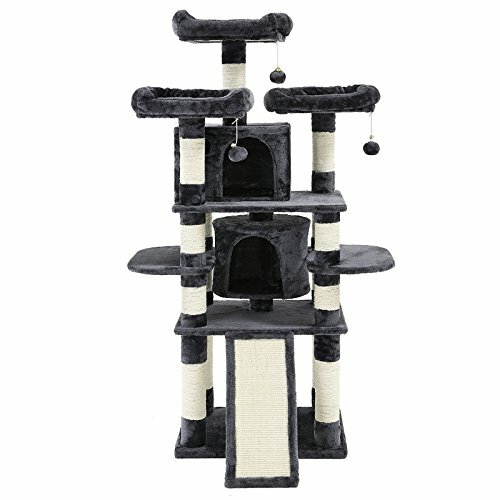 It is by far the most expensive cat tree on this list today But it also comes with the most features. The SONGMICS Multi-Level Cat Tree is an absolute monstrosity of a cat tree. It is definitely the biggest one here, coming with many different levels and reaching heights of 67 inches tall. This is not something you buy for a single cat or if you have very limited space in your home. With that being said, it does definitely keep them occupied all day long. For one, it comes with three hanging kitty balls that they can scratch and swat at all day long. They are fun little toys no doubt. The SONGMICS Multi-Level Cat Tree also features two middle resting areas and two side resting areas, both of which are covered with soft carpet. 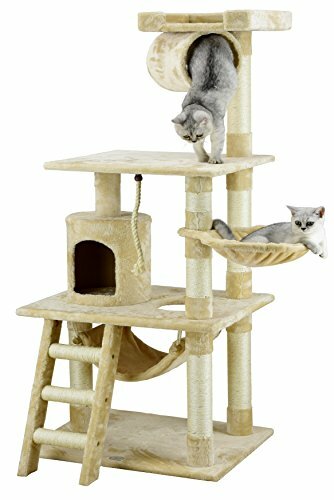 This cat tree also has two little cat houses with walls and roofs, so your cat can feel comfortable and secure, both of which also have carpeting. Furthermore, there are three high top perches on this cat tree, all of which are very soft and have little rims for safety. It even comes with a little ramp to get to the first level. The SONGMICS Multi-Level Cat Tree also features a total of 15 sisal rope scratching posts to keep their claws away from your furniture. If you have a single cat, we would recommend the AmazonBasics Cat Activity Tree. However, if you have multiple cats, the Go Pet Club Cat Tree is a good option to go with, and if you want your cats to live in luxury and have the best of the best, the SONGMICS Multi-Level Cat Tree is the way to go. For more top rated cat tree’s check out the top 10 list.